IfM’s Executive & Professional Development (EPD) team, in partnership with Atos and Paderborn University, has been recognised through the prestigious EFMD Excellence in Practice Silver Award for its professional development programme. The EFMD Excellence in Practice Awards recognise outstanding examples of effective and impactful leadership and development interventions between partner organisations. It is credit indeed to the IfM’s EPD team to receive a Silver Award in the Professional Development category for its partnership with Atos and Paderborn University. This globally recognised award is a first EFMD Award for the University of Cambridge and for any university Engineering department. ‘Gold for Experts’ was first run in 2013/2014 and is a six-month programme with a combination of taught modules and a major project. This programme, now running for the tenth time, has met the challenge laid down by Atos and is now the cornerstone of Atos’ Expert career track to develop the leadership skills of people with a technology background. Atos is a global leader in digital transformation with around 100,000 employees in 72 countries. The Group is the Worldwide Information Technology Partner for the Olympic & Paralympic Games. In its solutions and services business, Atos wanted to develop its business technology experts to be trusted advisors for customers, equipped with the strategic perspective and business acumen to complement their technology knowledge. The Gold for Experts programme was designed to address leadership development for people with a broad technical background, and make sure that it remained relevant and up to date in the ever evolving world of Atos and information technology. It would also need to take the changing internal business structure and environment into account as well as align with the growing ambitions of the organisation. To achieve this, Atos forged a partnership with the IfM to co-design and deliver a bespoke executive and professional education programme. Paderborn University adds Computer Science expertise to the partnership, leveraging an existing 30-year strong research collaboration with Atos, initially developed by Siemens. The programme is a combination of three one-week residential modules, a major project, and webinars. The modules include interactive taught sessions, facilitated workshops where proven tools are learnt and applied, simulation exercises, and project discussions and presentations. A collaborative and cooperative learning environment is maintained throughout the programme to maximise delegate learning from the programme and from each other. From a ‘focused’ expert to an expert with a strategic ‘end-to-end’ view who can connect their role to the bigger Atos picture and appreciate the impact of their work on different stakeholders. From a ‘local contributor’ to a ‘networked influencer’ who can proactively shape innovative Atos solutions and strategy. From a ‘technology expert’ to a ‘technology entrepreneur’ who can co-create innovative solutions to meet client business needs. From a ‘problem solver’ to a ‘trusted advisor’ who is sought after by clients, colleagues and partners to help them anticipate and navigate future challenges. Hubert Tardieu, Advisor to Atos CEO and Founding member of the Atos Scientific Community. Undertaking real projects to create impactful learning is a core part of IfM’s teaching practice. Group projects run throughout the entire programme culminating in a presentation made to Atos senior executives on the final day. The projects require delegates to work in teams of five people and tackle a real and significant opportunity for Atos, and propose a solution that generates value for clients and Atos alike. This opportunity to develop innovative technology ideas is recognised as a source of innovation in Atos. 60 projects have been completed to date, and continue to attract significant interest from Atos senior executives. 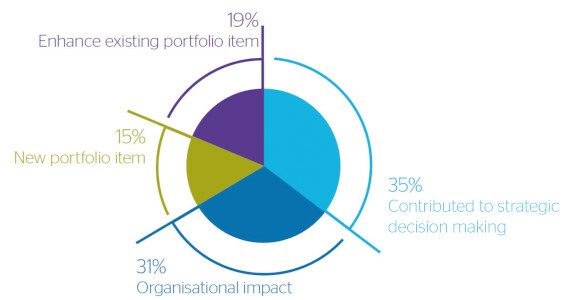 Of these projects, 65% have been taken further for organisational impact or to add new or enhance existing portfolio items and the remaining 35% have contributed to valuable strategic decision making. The programme’s impact also includes increased cross-division integration of senior experts, as well as an active global network of alumni sharing ideas and best practices. 80% of delegates are shown to be actively pursuing personal and professional development after completing the programme. There is a clearer career path for the expert community, and promotion of participants is twice as high as comparable profiles. For ongoing improvement of the programme itself, substantive feedback is collected from delegates and Atos stakeholders and a stringent review process is held to refine and improve the programme and keep it aligned with current research and Atos strategy. Webinar: Gold for Experts, what makes the programme unique?